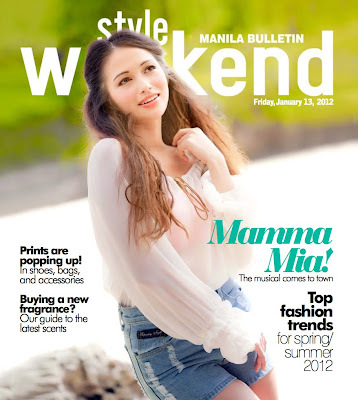 pls buy manila bulletin today (jan 13) for your free copy of style weekend! on the cover: model aliah heitz channels sophie of mamma mia! photographed by brian bravo on location at pearl farm beach resort davao, styled by kristine serrano, makeup by daniel lois buddy congson, hair by jonelle bansali. top by free people clothing and lifestyle, shorts by soul lifestyle. also in this issue: fashion experts tell us what's in for 2012, printed accessories, latest fragrance releases, lissa kahayon's mon-sun style, and more!